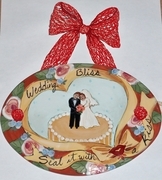 Whimsical Wedding plaque. Unique gift reads "Wedding Bliss, seal it with a kiss". Click on photo to enlarge for details.